The Bin liners, bin bags of 30 litres structured with an easy closing design so you can quickly and simply wrap up your full bin bag and dispose of it. Very resistant and environmentally-friendly; composition with 80% plant material (sugar cane from Brazil). Dimensions: 50x70 cm. 80% polyethylene plant derived ethanol from sugar cane grown in Brazil. 20% polyethylene fossil source. - Dimensions: 50x70 cm and a thickness of 15 microns. 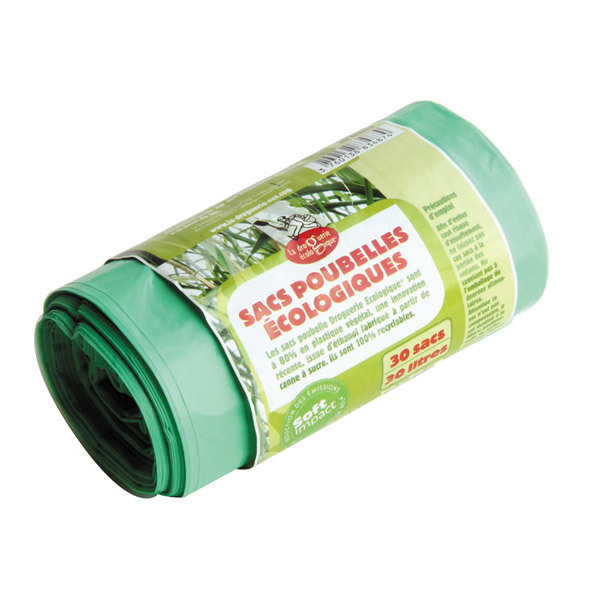 La Droguerie ecologique® is a sub-brand of the Ecodis® range. La Droguerie ecologique® develops products produced from renewable raw materials (eg, selection of wood-based products managed under the Eco-label FSC forests) or from materials which are almost inexhaustible (chalk, salt) etc. La Droguerie ecologique® even designs packaging that have a low impact on the environment. The direct and indirect costs of energy products and wastes resulting from their manufacturing are also considered in the environmental assessment of products (measuring carbon commodity index). La Droguerie ecologique® carefully selects sources and manufacturers in France and Western Europe to minimize the impact of transporting goods and to maintain employment and skills within the region.